Finnish artist Liisa Hietanen crochets and knits one-to-one imitations of her friends and fellow neighbors, accurately representing the subjects from their favorite outfits down to their furry companions. The series, Villagers, is a way for the artist to more deeply engage with those she often passes but might not interact with in her town of Hämeenkyrö, Finland. 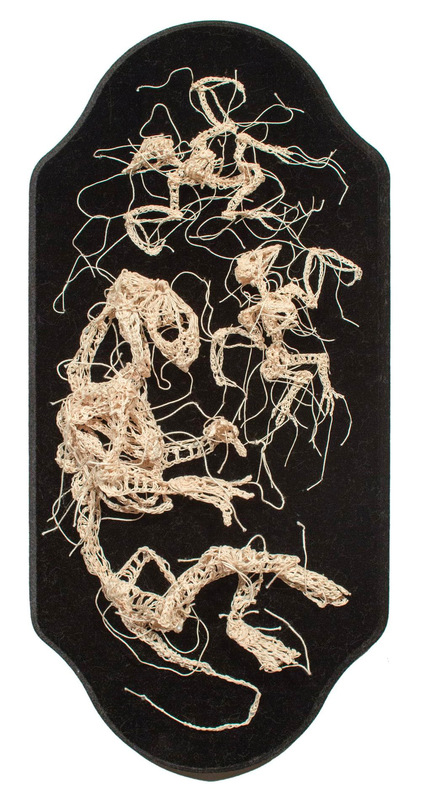 The slow, methodical style of her yarn-based craft works to counteract the pace of life, and also reflect the patience needed to get to know and understand another individual. 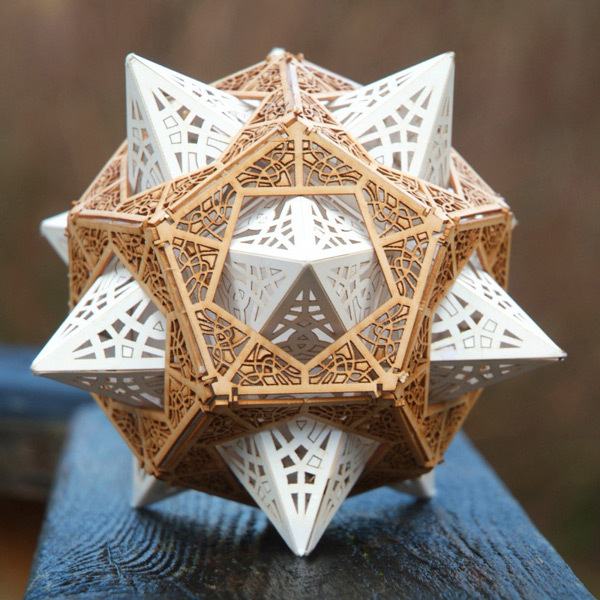 The accuracy of her works to their origin subject is never the focus, but rather how she is able to get to know the person as she takes the time to build their double. After completing each new work it is displayed somewhere public so the piece can engage in a deeper dialogue with the population of the town. Previous sculptures have been displayed at the local library, a flower shop, and a restaurant, however they also travel to contemporary art exhibitions such as the group exhibition From the Shadows of Night to the Brightness of Day at Makasiini Contemporary in Turku, Finland through April 7, 2019. Hietanen is currently working to complete a pair of new life-size sculptures—a local father and his four-year-old daughter. You can see other works included in her Villiagers series on her website and Instagram. 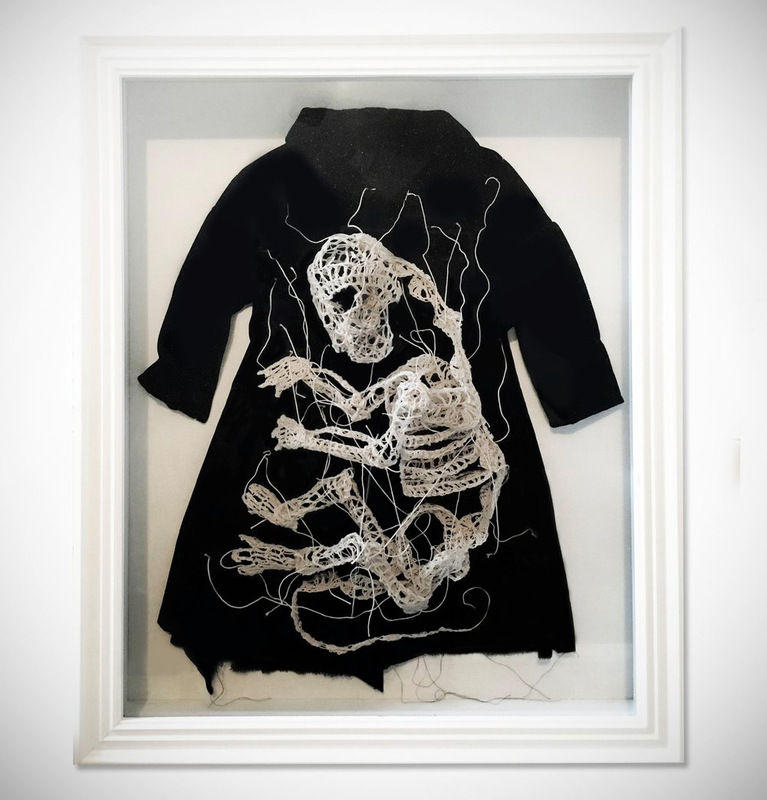 Caitlin McCormack (previously here and here) integrates mediums such as cotton string, vintage fabric, beaded objects, and other found materials into small crocheted skeletons. The textile works are presented as preserved objects like one might find in a curio cabinet. 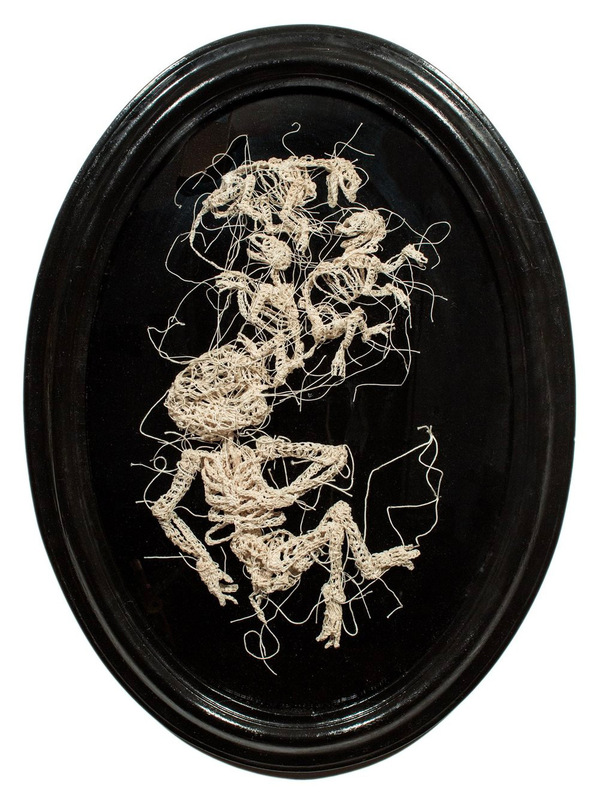 McCormack draws a connection between her skeletal subject matter and the viewer’s interiority, using fitted glass boxes and wooden frames as protection from the exterior world. Her fourth solo exhibition at Paradigm Gallery in Philadelphia, See You All in There, opens on February 22 and runs through April 13, 2019. You can see more of the artist’s work on her website and Instagram. Irish visual artist threadstories crafts wearable textile masks that are often full-coverage, obscuring her face with layers of multi-colored yarn. 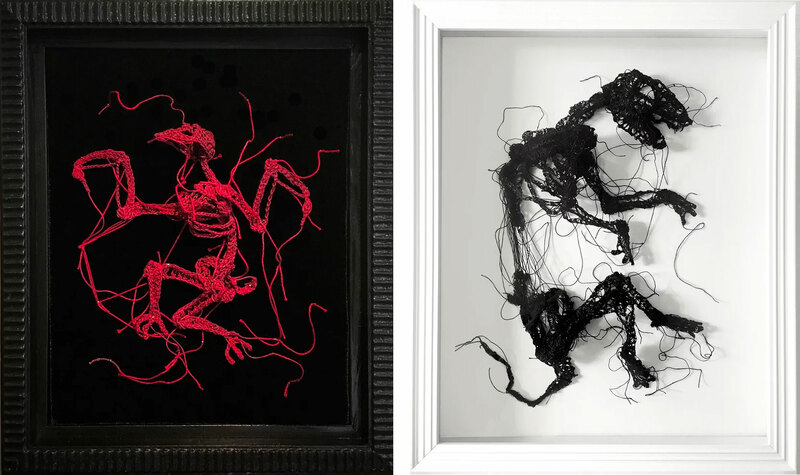 The works are made with traditional techniques, and inspired by everything from the art of basketweaving to Francis Bacon’s distorted figural paintings. Each work begins with a crocheted balaclava which the artist uses as a base to attach each segment of material. Brighton, England-based textile artist Kate Jenkins has been recreating veggies, seafood, and other favorite foods in wool for the last 12 years. Jenkins got her start in knitwear design, but has begun to focus on knitting feasts rather than fashions. In 2015 Jenkins made her largest installation to date, crocheting dozens of sardines, mussels, clams, shrimp, prawns, lobsters, crabs and other delights from the sea for a full-size fish counter titled “Kate’s Place the Stitchmongers” in Alexander Palace in London. For inspiration Jenkins knits or crochets from life, always purchasing the food she plans on recreating for accurate scale and texture. Artist Ashley V Blalock crochets enormous red doilies that she then installs in site-specific configurations ranging from galleries to stairwells to trees outside. Her ongoing project, Keeping Up Appearances, began in 2011 and has been installed at museums, galleries, and gardens across the United States.